Material: 25 mil Composite. The inlay is laminated between two layers to protect it from damage. Vehicles simply approach the gate and the RFID reader will authenticate the permit and allow the vehicle to pass through. It’s no longer necessary for customers to roll down their windows and swipe a card. Increased efficiencies in your parking management process will result in reduced emissions and a smaller carbon footprint. Plus, avoid permanent attachment to windshields, making these hang tags removable and reusable. 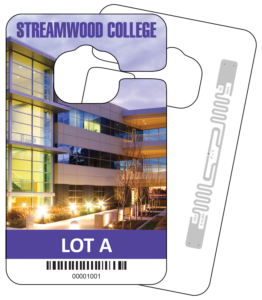 As long as it operates in the UHF frequency and conforms to the EPC Gen2 protocol, RFID Readers from multiple vendors can communicate with our hang tags. There are many ways to approach how the human-readable permit number is encoded into the permit, making it more difficult for someone to produce a counterfeit permit. Plus, you can ask your systems integrator about encrypting or scrambling the communication between permit and reader. Contact an Account Representative today at (800) 448-1991 or email sales@rydin.com to learn how to leverage this technology to improve your parking control system.